Each day, more and more devices are going wireless than ever before and with the proliferation of smart devices such as home sensors, security systems, and even smart televisions and IoT devices, no longer are your PC and smartphone the only devices that need wireless connectivity. The complexity of these new devices means that they need to be online 24×7 with very minimal downtime and therefore, require high-speed always-on wireless internet access. This is where the 802.11ac Wi-Fi standard comes in. Devices that support this standard can connect over the 5 GHz wireless frequency band. This band allows for a much higher bandwidth than what is possible with the previous 802.11n or 802.11g standards, which are based on the 2.4 GHz frequency. Also, OEMs can add additional 5 GHz bands to minimize interference when multiple devices are connected to the router. The only caveat with the 5 GHz band is that the range is somewhat limited when compared to the older standards. However, all manufacturers also include the 2.4 GHz band for backward compatibility with older Wi-Fi devices and also to increase the operating range. For this article, several factors were considered for narrowing down the best 802.11ac router options available in 2018. Since this standard is all about speed, only the fastest routers currently available are included in this list. Other selection criteria include the number of bands supported, maximum coverage offered, connectivity options, software UI etc. The popularity of these routers with buyers was also taken into account. So, here are the 8 best 802.11ac routers available in the market today. The NETGEAR Nighthawk X6 is one of the best long range wireless routers and can work over long distances without any dead spots. The Nighthawk X6 is a tri-band router with a single 2.4 GHz band and dual 5 GHz band. The included software can assign individual SSID’s to each band and QoS settings can also be applied independently to each SSID. This router also supports NETGEAR Single Sign-On (SSO), which means if you have multiple NETGEAR devices you use a single login credential to log in to all of them at once. While the devices themselves are great, be aware that NETGEAR’s support is not known to be the best-in-class compared to some of the others in this list. The Nighthawk X6 has received a lot of new firmware updates but these have mostly catered to the UI and have hardly added any new features. You also cannot replace the antennas for larger ones to extend the range. However, that should not be a huge concern as the Nighthawk X6 already offers great coverage for most mid-sized to large homes. Cons: NETGEAR’s service needs improvement; Antennas cannot be swapped for larger ones. The ASUS GT-AC5300 is one of the best gaming routers available and it reflects in every aspect of the device right from the aggressive styling to the performance. The GT-AC5300 packs some serious power under the hood. The built-in Game Intrusion Prevention System (Game IPS) and the Trend Micro AiProtection system act as firewalls and prevent most DDoS attacks or unwanted incoming pings. Gamers also get access to the WTFast Gamers Private Network for faster pings and secure connections. Like many ASUS routers, the GT-AC5300 supports AiMesh but you have to manually force an update to enable the functionality if you have other ASUS routers in your place. The GT-AC5300 also supports band steering and beamforming so the router automatically assigns the clients to bands depending on the bandwidth requirement and physical distance. The ASUS RT-AC88U is one of the best wireless routers for home and office applications and it also comes with a good dose of security options and the performance to boot. A good feature of the RT-AC88U is that it offers enhanced throughput in the 2.4 GHz band offering up to 1000 Mbps and a 2100 Mbps throughput in the 5 GHz band giving some of the triple-band routers a run for their money. The RT-AC88U is also one of the best W-Fi routers for long-range applications as it has powerful 4-transmit 4-receive (4T4R) antennas that promise a wide coverage up to 5000 sq.ft. If you wish to opt for the wired route, you can take advantage of the 8 Gigabit Ethernet ports. A 1.4 GHz dual-core CPU ensures all traffic flows freely without bottlenecks. ASUS’s characteristic AiMesh and AiProtection are included as well. When you first buy this router, do a hard reset to resolve any connectivity issues. To further ensure a stable connection, try decreasing the frequency of some of the operating bands. Cons: Buggy firmware; Wi-Fi band frequencies need to be manually adjusted in some cases. The Linksys EA9500 is one of the best Linksys routers available and is also one of our picks for the overall best routers of 2018. The router offers a maximum throughput potential of up to 5.3 Gbps, which should be enough for the most demanding of users. A 1.4 GHz dual-core processor and support for MU-MIMO ensures each device can connect independently without affecting the bandwidth of the others. Sporting 8 antennas, the EA9500 offers excellent coverage but the design is not the most aesthetic-friendly of the lot. If you still notice dead spots, you can use the Linksys Max-stream range extender to further extend coverage. The 8 Gigabit Ethernet ports help catering to those who prefer wired connections as well. The EA9500 is hard to beat when it comes to raw performance but there have some reported concerns with respect to connectivity issues and signal drops. Buyers have reported that some of these concerns can be easily fixed by disabling MU-MIMO or IPv6 depending on the problem. Luckily, flashing DD-WRT firmware is possible for those who’d prefer fiddling with some of the advanced firewall options or settings. The Linksys WRT3200ACM stands out from other routers in this list in the way it uses its 5 GHz band. It is not a tri-band router but the WRT3200ACM uses multiplexing to double the 5 GHz bandwidth using what Linksys calls as Tri-Stream 160. Another advantage of this router is that it can operate in a clear dedicated airspace using Dynamic Frequency Selection (DFS). This means less interference when it comes to using it alongside other wireless devices such as microwaves or wireless input devices or even other routers in the vicinity, which generally occupy the 2.4 GHz band. DFS also helps in the security aspect of the router and the clients connected to it as well. The WRT3200ACM really shines when the custom firmware is installed. Linksys routers are generally OpenWRT compatible so searching and installing a compatible third-party firmware should not be too difficult. However, if you prefer to keep things as it is, the included smartphone app should get you by for basic functions. If you are looking for a Network Access Storage devices plus high-speed wireless router, the Synology RT2600AC is for you. True to its lineage, the Synology RT2600AC is one of the best secure routers out there. Feature-wise, the RT2600AC can give some tough competition to other popular OEMs in this price range with the presence of 4 antennas, MU-MIMO capability, beamforming, and a 1.7 GHz dual-core CPU as well to prevent any bottlenecks. The Synology Router Management System is a highly feature rich software for everything related to security and traffic management. It also comes with its own mini app store from where you can download Synology NAS apps, VPN apps, and intrusion prevention apps to further enhance your security. Security-conscious buyers will be pleased to know that Synology’s software is always kept up to date and it is very easy to transform your home network into a DLNA server or a private cloud. The NETGEAR XR500 Nighthawk Pro Gaming does not come cheap but offers a stellar performance especially for gaming and multimedia. Gamers will appreciate the built-in DumaOS that sports features such as game prioritization from consoles and PCs, bandwidth usage statistics, and also location-based QoS. You can also use the built-in gaming VPN client to protect devices from DDoS attacks. Since the XR500 is built with gamers in mind, a high-performance level is almost a guarantee. Coverage is very good even in large homes thanks to the powerful 4 antenna system. While DumaOS is a highly capable software, it does not provide a mobile app and only the remote admin can only be secured to one IP or range. That said, the NETGEAR XR500 Nighthawk delivers when it comes to ensuring a lag-free multiplayer gaming experience. The TP-Link Archer C5400X is the newest product on the block and it surely has the most stand-out looks among all routers we’ve seen so far. 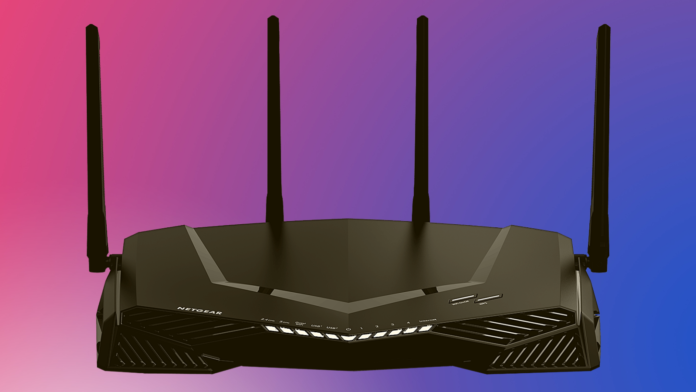 The Archer C5400X is built for gamers and comes with all the bells and whistles that make a drool-worthy gaming router including a 1.8 GHz quad-core CPU, 8 antennas, beamforming, and more. Also onboard is 16 GB of internal storage and a secure FileBank app that can store your critical and sensitive data. A unique aspect of the Archer C5400X is that it can identify the type of device connected and can automatically adjust the speeds to best serve the client using a feature called Smart Connect. There is support for Amazon Alexa for controlling most actions using voice commands. The router is still fairly new in the market but there is already considerable interest among prospective buyers. Judging by the features, we must say TP-Link has a winner in their hands although, the entry price can potentially sway buyers towards other similar offerings. We will continue to cover a great deal of information about routers at various price points and features. If you’re on the lookout for a capable 802.11ac router, then we hope this article has addressed your needs. Although this list includes only the fastest routers, you will also find 802.11ac routers that offer lesser speeds at lower price points. We recommend that you check out our articles on best routers under $50 and best routers under $100 for viable alternatives. If you’d like to explore other categories, check out some other articles in this series below. Dear readers, that wraps up our comparison of the best 802.11ac routers to consider buying in 2018. Let us know if you have additional questions in the comments below. We will do our best to provide a timely response. Please share this article online and don’t forget to follow TechNadu on Facebook and Twitter for instant updates.